I’m betting everyone who reads the title to this entry can relate to that phrase. 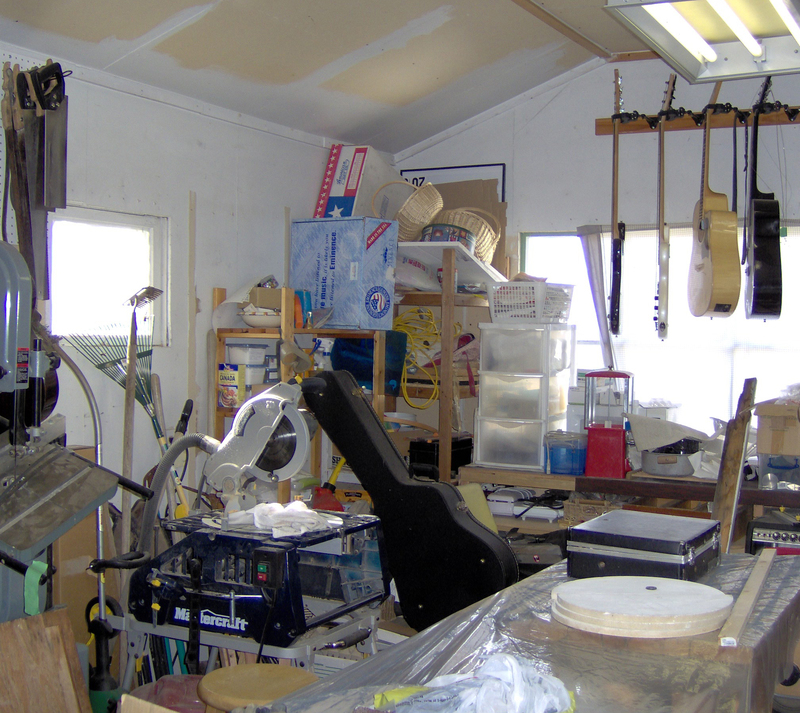 No matter how much of our house, our life, or our yard we get organized, somewhere, lurking, is a mess. The one you can avoid because it’s not in your face. The one created by organizing other areas of your home. We all have ’em. 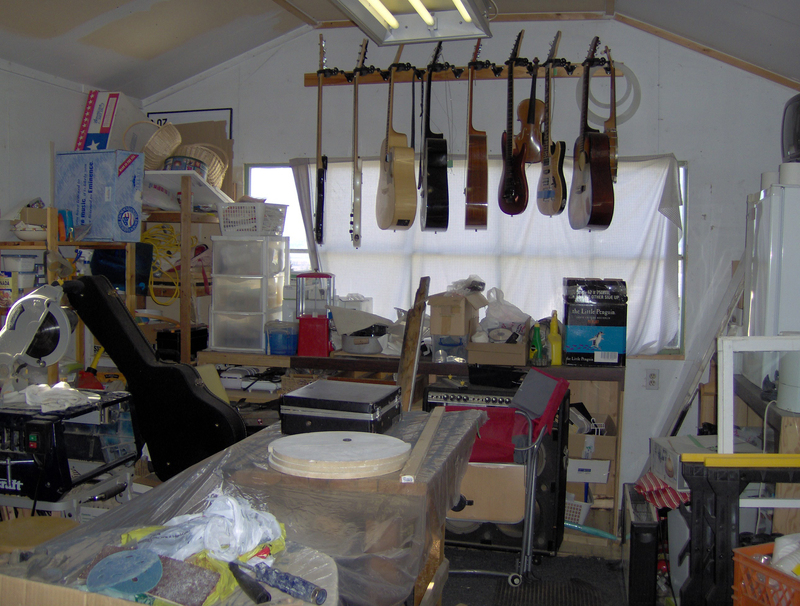 Our biggest mess at present is in what has become the great Dumping Ground in our life: the garage-shop. Yup…I’m posting this online. It’s a motivational thing. I really want to make some soap for Christmas gifts and I have to get on it now so it will cure sufficiently to be used by then. What you see under the garland of guitars is my soap-bench. It’s the area we initially designated for soap-making. 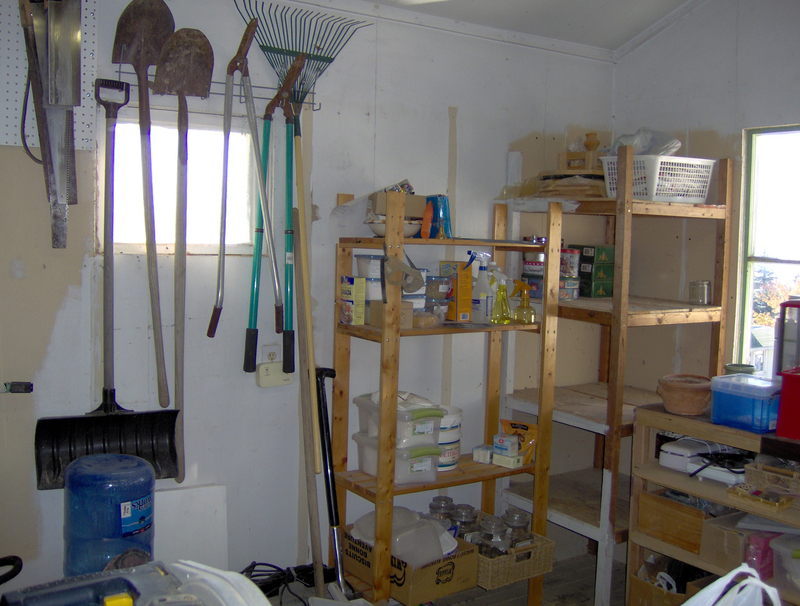 Because I don’t have to go out there very often, this building gradually accumulates the stuff we don’t know what else to do with…or are too lazy to deal with properly. Once it’s there I avoid dealing with it. Mostly because of the spideys. There’s not lots of them or anything, but the ones that might be there are just lying in wait for ME. They’re going to jump on my head and try to eat my brain. Like Zombies. Ok, so I’m a little phobic. Another part of the problem with this space is that it’s full of supplies, both mine and my husband’s, that could be used in creative endeavors. If we could get to them. Often the biggest roadblock is simply a lack of access to what we need. Having to move a bunch of stuff to get to where I think maybe the stuff I need for my project MIGHT be is pretty much guaranteed to stop me dead. The Muse hates obstacles and will retreat to her cavern to sulk if she encounters them. So we got started…we’ll soldier on tomorrow and try and deal with the rest of this mess. The good new is that when you tackle a project like this, sometimes you find Treasure!! Arrrr Mateys!! I also found my pattern-book from when I was in the Society for Creative Anachronism…..the folks who do Renaissance Faires. People get all dressed up like knights and maidens, kings and queens, princes and paupers. They drink mead, play lutes, and the men swat at each other with handmade swords while wearing armour that smells faintly like hockey gear. Sometimes not so faintly. Brilliant fun.